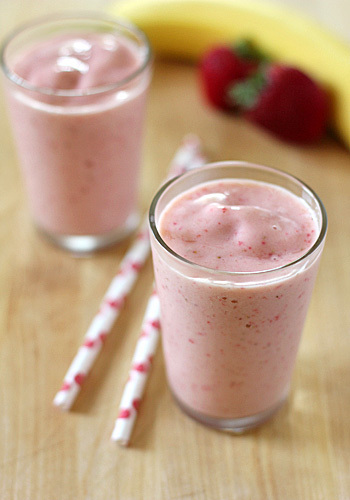 In a blender, combine the orange juice, yogurt, strawberries, and banana. Blend until completely smooth. Serve immediately. Enjoy! I make a smoothie very similar to this one actually. I just use raspberries and a little bit of vanillasugar. I've not been much for smoothies, myself, but this recipe looks great. I love the idea of using frozen fruit instead of ice. You never cease to amaze me. So.......... pretty! You make even a simple smoothie sound like an epicurean delight!